If you’ve been following my blogging journey for a while here, you already know that we live in an older home. It was built in 1977 to be exact. The house really has a lot of character and charm, but the kitchen really needed updating. The cabinets and drawers were self-destructing and our silverware drawer had taken up residence on our kitchen counter for a couple years. The kitchen faucet recently began to leak and the kitchen was just screaming for attention! Ah! We’d been wanting to update ever since we moved in a little over three years ago, but finally, it was time! Yay! Our New Improved Kitchen! 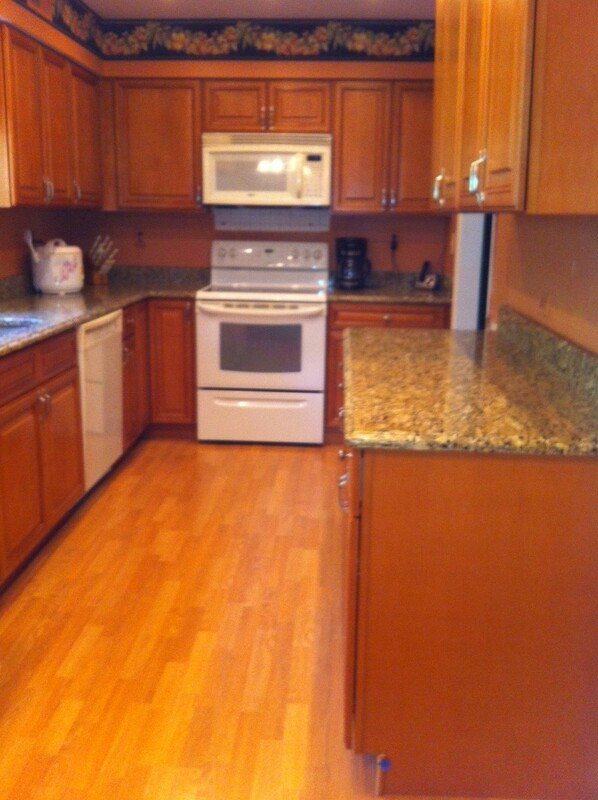 Real wood cabinets and granite countertops. We reused the cabinet handles and drawer pulls we had since they had recently been replaced. 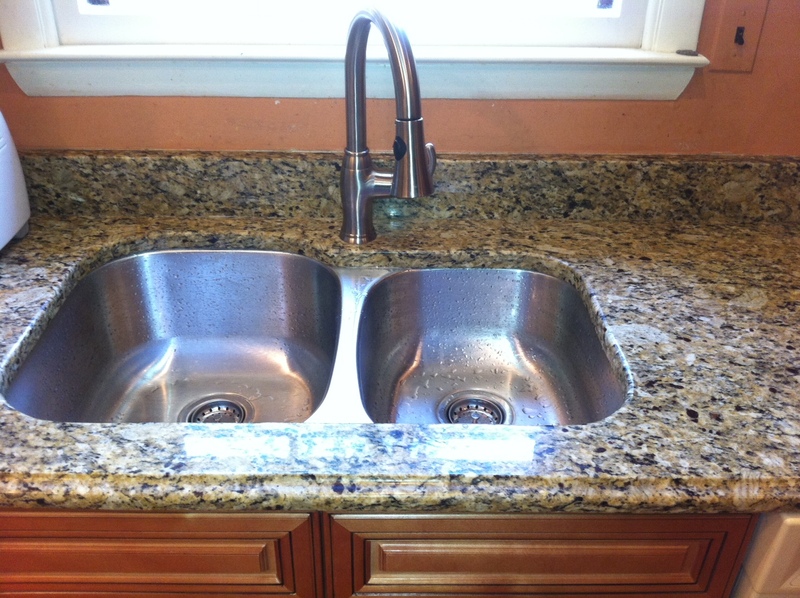 Stainless steel sink w/pull out sprayer faucet. The installers have to come back soon to install soap dispenser into granite. (They forgot.) Loving the deep sink on the left, especially for baking dishes, etc. No more caulking around the sink. Love the undermount! 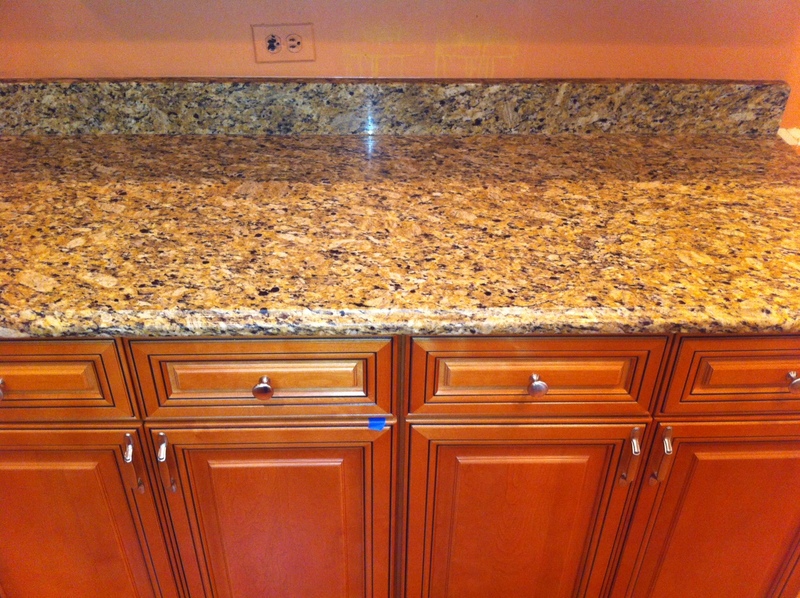 Close up of granite & cabinets. Love how easy it is to wipe up messes on the counters and it just looks fabulous! This old house deserved a stellar kitchen! We scheduled the remodeling to take place the day after we returned from visiting our son. The kitchen cabinets were delayed by a day, however, so they began work on that Tuesday. The timing could not have been worse as we had a serious car accident that Sunday night and all of us were in a great deal of pain, but the end result sure is lovely. We were without a kitchen sink for several days, which meant lots of paper plates and carry out. The kitchen was a bit discombobulated. We emptied all of the kitchen cabinets and drawers before we left for our trip. We had boxes of dishes and pans in the dining and laundry rooms. Our dining room table was completely covered with yet more dishes. It looked like we were moving! You don’t realize what you have until you remove everything from the cabinets! (A few items went in a box for the Salvation Army.) Finally, it was all worth it, in the end!! 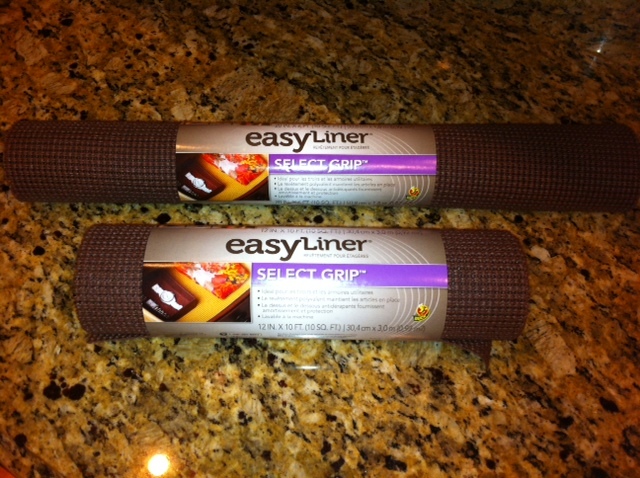 Next project is painting the kitchen a taupe color and removing that hideous black fruit border. Lastly, our thoughts are to replace our bisque appliances with stainless steel. We’ve priced them at a number of places, but have decided we’ve spent enough money for the moment and will wait. We also have the thought to search out (minimally) scratched appliances that have been marked down. We’ve done that in the past (and been pleased). The installers also have to return to install the cabinet pull outs for the pan and Tupperware cabinets. We had those in a former house and I love the ease of use. We added several cabinets so this will increase our storage space, which was much needed as our kitchen is small to begin with. No pantry here, except that I do have a closet in the laundry room (next door to the kitchen) that we use to store large appliances and some pantry items. One thing I recently learned is that I can’t use my nifty vinegar and water household cleaner on the granite! Apparently since granite is porous, the acid will remove the sealant and cause etching. So, I’m going to mix up a spray bottle of dish detergent and water to use for now. I refuse to pay $7 for a bottle of special granite cleaner when soap and water will do the trick just fine! 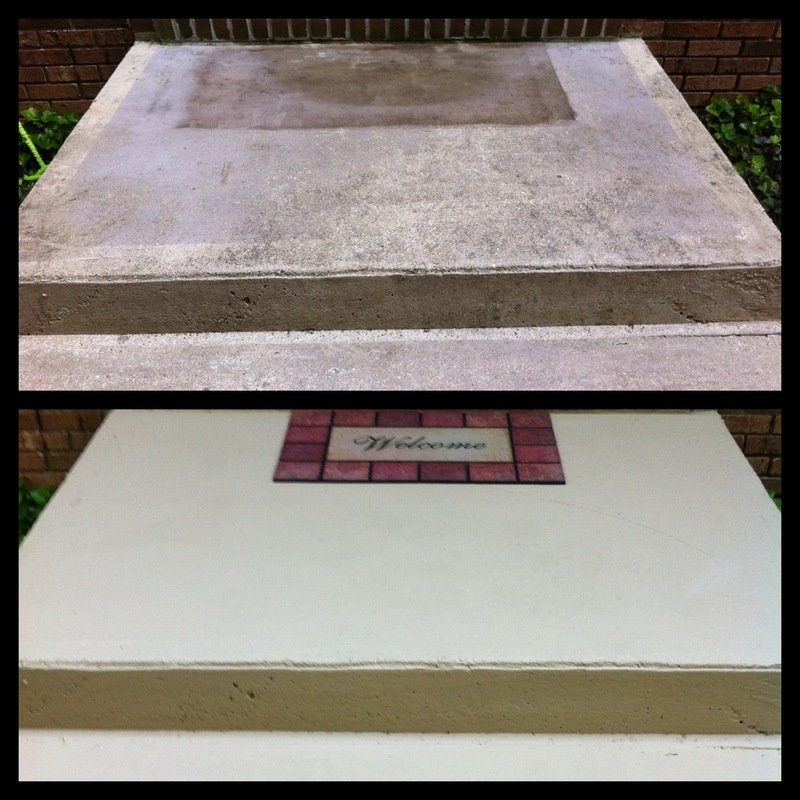 We are going to apply a granite sealer to provide a waterproof barrier and help preserve the shine. We recently had a contractor come out to give us a quote on replacing all of our windows (all 25!) and are waiting to hear what the final figures are. (We’ve received several quotes and they want an arm and a leg!) At a minimum, we will have the kitchen window and frame replaced as the wooden frame has been rotting for some time. He’s also going to give us a quote on power washing the siding and roof, which would be an awesome improvement. So, we’ll see how reasonable he is. This contractor was referred to us by a good friend of mine, who just had 17 windows replaced, and she was very pleased. We’re focusing on spot cleaning the carpet throughout the house this week. Fortunately, we have more wood floors than carpet, but the bedrooms are carpeted. My daughter is actually pretty talented at getting stains out with baking soda and lemon juice, which is very helpful. I declared 2014 a year of simplicity and have been purging like mad over the last few months. My teenage son’s room was on my recent “hit list” and, boy, did I have my work cut out for me! First, I got the back hoe … Okay, maybe not, but was tempted … I completely filled a kitchen trash bag with garbage and two other kitchen trash bags with donation items for the Salvation Army. Mind you, it hasn’t been that long since the last purge in his room! I decided to remove an old bookshelf from his room and put it on Freecyle. The shelf needs new support pins. But, more importantly, my son needs fewer items in his room in order to maintain some sense of organization. The shelf just winds up being a great landing spot for junk, so it’s for the best. No worries, he has other furniture. What a transformation! There actually is carpet in his room! So, purging is part of our overall home improvement plan as well. How is it that we wind up with so much stuff?!?! It honestly perplexes me. I hold onto way too much little stuff. Lately as I’ve considered parting with more, I’ve realized that it’s hard getting rid of things that were given to me. I’m not even referring to family gifts or heirlooms or anything that special … just stuff. Nonetheless, I’m getting better at releasing items to good homes and have been a weekly contributor to the Salvation Army for the last couple of months. 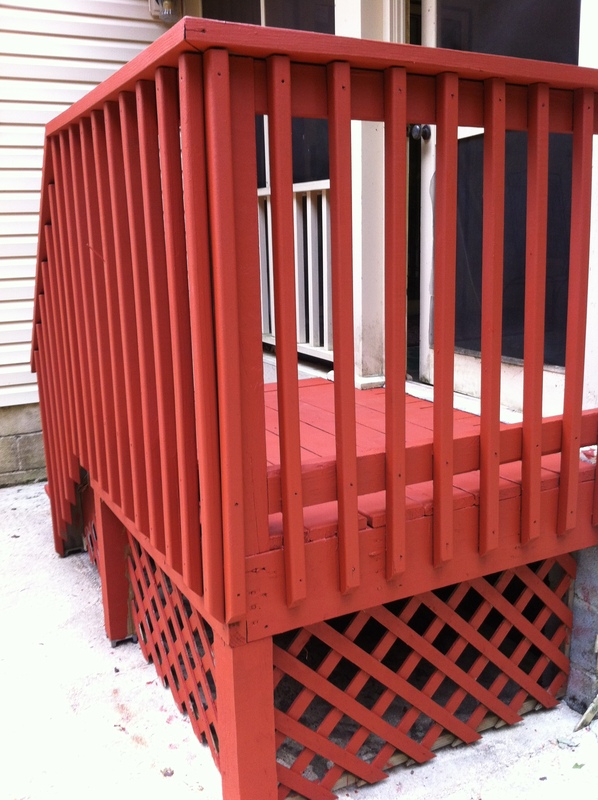 Here’s to more home improvements in 2014! What’s on your list? I am so proud of my husband getting a number of projects done around the house this weekend!! He was on a roll unlike anything I’ve seen in a while, I must say! Yesterday he installed our new doorbell, which was a great blessing after being without one for several weeks. Wonder why we haven’t had any company for a while?? Haha … just kidding. He also installed a new bathtub drain stopper (the kind you push down on) in the master bath as our old one never worked right since we’ve lived in this house and then gave up completely several months ago. So, now I can put that Bath & Body Works Japanese Cherry Blossom bubble bath to good use! Sounds divine! And, yesterday, after church, my wonderful and highly skilled husband installed new massager shower heads in the upstairs two bathrooms. It’s the kind you can remove from the base or remain stationary. Definitely an upgrade from the former shower heads! I’ve mentioned in a previous post that our house was built in 1977 and has two of the four bathrooms with original tile work. The upstairs hall bath has a mustard yellow theme and the upstairs (former) master suite has a pale green theme. Charming in 1977, I’m sure. Not so much in 2014. 😉 But, we’re working on improving things around here, bit by bit. Last week, we had three new toilets installed, so bye-bye to the mustard yellow and pale green commodes! After my love finished all of that, he went outside and spread Scott’s Turf Builder on our lawn, tossed the football and played basketball with the kids! Whew! What kind of vitamins is he taking? Haha. Productive weekend! I love it! We’re expecting rain on Tuesday, so that’ll be good for the grass. We have some other upcoming projects in mind… For one thing, our HVAC guy informed us last week that we need to have a valve replaced and some other work on our system to the tune of $809! *Ouch* And, that’s including our 15% discount on our current maintenance plan. Not good news. Unless you count the fact that it will once again run at optimum efficiency after the repairs, thus, reducing our electric bill. That is the major upside to this huge pill that’s difficult to swallow! The other major renovation we have contemplated for some time now is our kitchen. It’s a small pass through kitchen, almost galley style, but it’s in an L shape instead. Small nonetheless. We want to replace the ancient pressed wood cabinets and formica counter tops with light cherry wood cabinets and granite counter tops. Ooh-la-la! Yes, this home ensures no roots of boredom grow around here! What home improvement projects are on your list this year? It’s springtime! And spring is synonomous with home improvement, isn’t it? It is around here anyway. The natives are restless from a long winter and anxious to get some things done now that we are beginning to thaw from an arduous winter. Our house was built in 1977, and while it possesses many fine qualities, there are some issues to be reckoned with. In our nearly twenty years of marriage, we’ve only owned new houses up until three years ago. We’ve done more interior painting and installing wood floors, tile and lighting fixtures than we’d care to reflect on in years’ past, but a house this old has a mind of its own! Take, for instance, a simple thing like our doorbell decided to give up the ghost. My dear husband attempted to repair it, but noticed an inner part had been damaged beyond repair. So, we ordered a new one ($19.99) on Amazon. The configuration of the new receptor is much smaller now, so we would have to try to match up the old wallpaper border if we hung it where the previous one was. But then my husband had the bright idea to put the old one back on the wall for now (no wallpaper repairs necessary) and we’ll hang the small one in an inconspicuous place. I thought that was sheer genius! Shortly after moving in, our kitchen drawers began literally falling apart. I’m pretty sure they’re the original cabinets and drawers and are made of some hideous pressed wood on the sides, which is warping by the minute. Right now we have two drawers out of commission. The cabinet/granite guy came out again yesterday to re-measure, and if he and my Negotiator Husband agree on the price (which I think they will), we will have a new and improved kitchen soon. Goodness knows, we need it. I’ll post pictures when and if it happens. 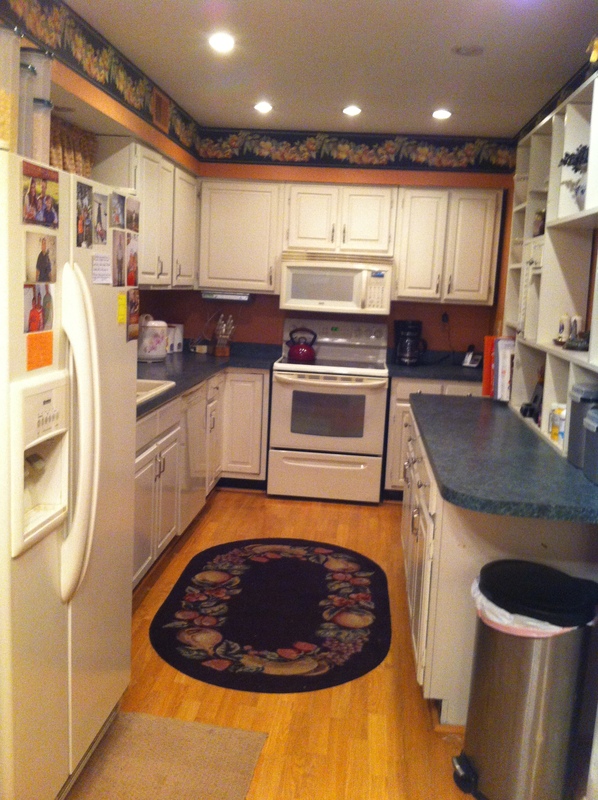 We have a walk through kitchen, the smallest we’ve ever had, with virtually no pantry. We’ll be adding two upper cabinets, which will offer much needed additional space. We have four bathrooms. Yes, 1, 2, 3, 4! That’s a lot of bathrooms, considering I grew up in a humble home, where at one point, 7 people shared one bathroom! And, somehow, we survived! But, I digress… Four bathrooms. My daughter’s toilet has never behaved properly since we’ve lived here. My husband has gone to specialty plumbing stores in an attempt to purchase parts and, invariably, it doesn’t work out. He’s pretty handy too. This toilet is blue and definitely circa 1977 . We’ve wanted to replace it but have held off. Our first quote was over $400 for a plumber to replace it. I called another plumbing company last week to get a quote and they said $618! Can you imagine? For one stinkin’ toilet?! I hope it was gold plated at least! Then last weekend, the day before my sister was due to visit, the upstairs hall toilet decided it needed some attention and repairs. This one is mustard yellow. Definitely 1977. What was up with all the colors back then?! That bathroom needs a complete remodel, but that’s another matter for another day! And then we have the master toilet, which is white, but older, although not quite 1977. It sits very low as a previous owner had polio and must’ve been made to accommodate him. It’ll be good to replace it. The downstairs hall toilet is relatively new, so it’s fine. Initially my husband and son ran to Home Depot yesterday to purchase a toilet valve kit, but then he got the idea just to replace them. Yep, all three! The Lord was truly with us, though. We got a multiple product discount, making each toilet $78, plus a break on the installation fee. So, a total of three toilets installed for $600! They wanted to charge a haul away fee of $35 for each toilet, but my thrifty husband declined. (Yay for him!) 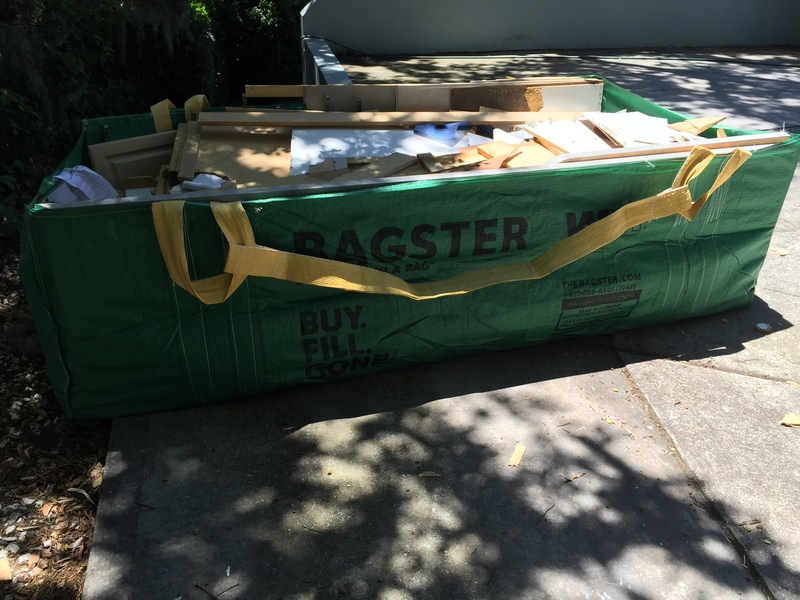 His initial thought was to haul them to the landfill himself, but we may put them on Freecycle or ask a home improvement friend if he wants them. Then, our disposal cost is $0! So, we’re pretty thrilled about our overall deal! It seems lately a number of things have gone on the blink around here! We just had our garage door repaired to a tune of $450, which was lowered from the initial quote of over $650! (thanks to my wonderful, negotiator husband!) Last week I discovered a leak under the kitchen sink. It’s only a slight leak, fortunately, but will no longer be an issue once we remodel soon. We’re getting an undermount sink with granite countertops. I’m so excited that I’ll have a sprayer hose that actually works! What a concept! 😉 Our current sprayer has never worked since we’ve lived here. Truly disappointing. This Old House … Ya gotta love her! Our house has a lot of charm, really, it does. 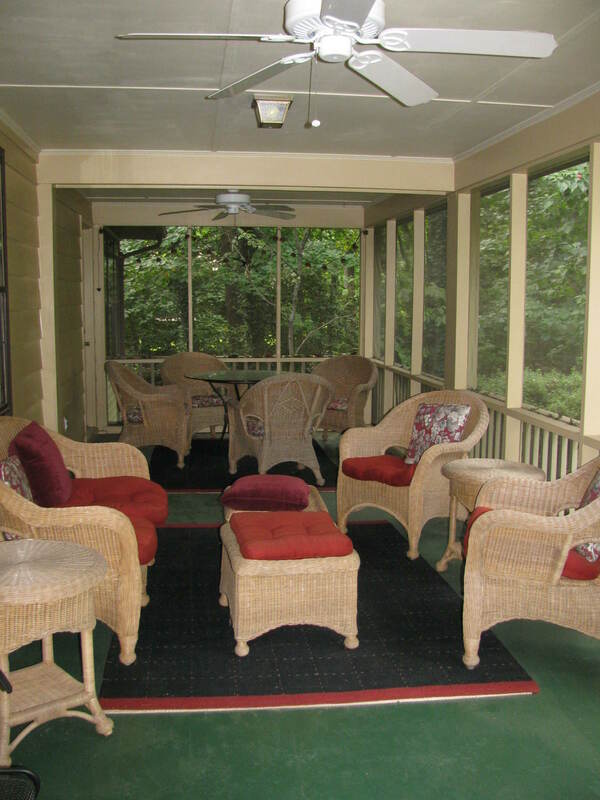 It just demonstrates the fact that houses require a lot of upkeep and constant care. I’m really surprised that the previous owners didn’t upgrade the upstairs’ bathrooms, but I think they rarely used the upstairs once their kids were grown. So, it wasn’t a focus. They did, however, do some updating on the main level, which is part of the charm that sold us. If we stay here long enough, the windows are next! Our unspoken motto is: “We never pay full price. Ever.” No matter what the project is, we try to do it ourselves first. If a professional is required, then we comparison shop until we find the right price. The right price is the price we are willing to pay. Our budget dictates being as frugal as possible, especially since we are a one income family in a high cost of living area. We would never sink more money into an investment than we anticipate realizing in the future. That goes for any investment, particularly a house. It’s called wisdom. For example, if we didn’t think the kitchen was an ideal room to invest money in, we wouldn’t proceed. However, since we know that prospective homebuyers focus on the kitchen first and bathrooms second, those are worthy investments. We are always thinking in terms of resale. 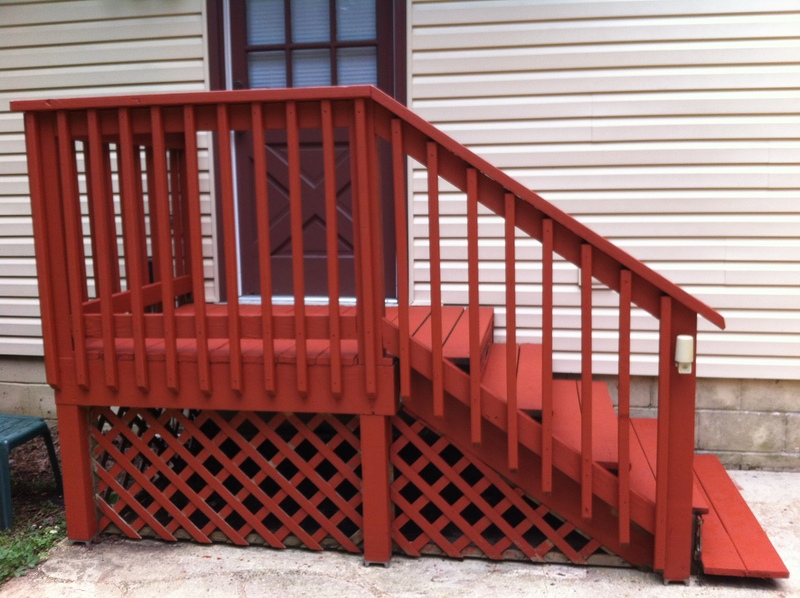 Do you have home improvement projects in mind? If so, care to share?